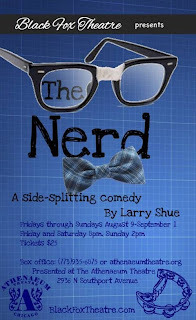 Once upon a time I went to a show and it was called The Nerd. It was about this guy Willum whose life had been saved when he was in the Vietnam War by a guy named Rick (Guy Wicke). It is not still the war; Willum is an architect. The play is about how when Rick comes over to his house he turns out to be kind of a crazy person. It is a very funny show, but it is also kind of distressing because the things that Rick does are so horribly weird. My favorite character was Rick even though he was sort of the bad guy. He was very interesting because he had a lot of weird things to do and a lot of things to say, like "This is fun!" when they were staring at an apple core. At the party I started to be really irritated by him, but in an interesting way. When they were doing the bags on their heads, he was just messing up this party, but it was interesting because it was so crazy. I also really liked it when they were playing "I went on a trip," and when he was supposed to say something that started with E, he said, "a map of the area." I thought it was funny because he was on E and M is not even close to E. I really liked it when Rick played "Venus in Blue Jeans" on the tambourine. He only had to use the tambourine actually once. He only had to do one shake which was pretty funny, because he said, "I know how to play it on the tambourine." I really liked it when Willum, Axel (Philip Aman), Rick and Tansy (Jasmine Ryan) were singing this weird song where they were rhyming everything. Like, "Take a bowl of cottage cheese! Throw it out on Mr. Trees!" Everybody really seemed like they were going crazy or something. Willum is trying to get Rick out by doing weird rituals. I thought it was really funny when Ticky (John Wilson) came in with cottage cheese all over him and said, "I would like an answer to why I am all covered in cottage cheese." And then Rick said, "Is it your way?" I thought it was funny when Clelia (Shawna Tucker) kept doing this plate-breaking thing. When she got angry she had to take a few saucers and break them. She would take a hammer out of her bag and smash it kind of angrily and kind of matter-of-factly. How many saucers do you think they had to buy? Like 5 for each show, right? Sometimes her son, Thor (Jack Edwards) and sometimes Rick made her angry. But her husband never made her angry, at least not as angry as she was made by her son or Rick. At least she never had to break anything about him. Once she and Tansy went into the kitchen where she broke those saucers and when they came out after all the boys had heard crash crash crash, all the boys said, "What was going on out there?" And then Tansy said, "That was just girls' talk." I thought that was pretty funny because it was obviously not just girls' talk. I thought it was funny when Tansy accidentally said what kind of underwear her boyfriend wore, which were flower ones, even though he is a boy. Boys can wear flower underpants, but it was a little weird her saying it in front of like five people. I thought that Willum and Tansy, how they were boyfriend and girlfriend, was pretty sweet. It seemed kind of like a romantic relationship and kind of like a kid's relationship with a friend. People who would like this show are people who like tambourines, saucer breaking, and cottage cheese. 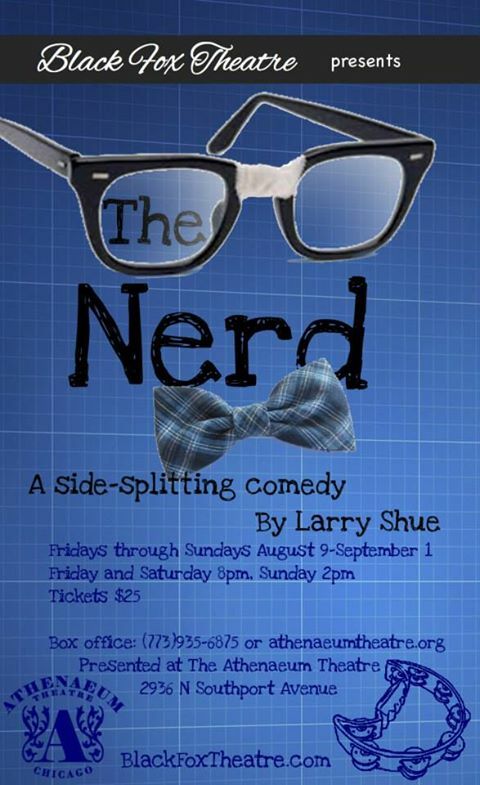 People should go see this show because it is funny and crazy but the message isn't unrealistic. Willum learns that even if you think something is really important to you, it still could not actually be. Then you can make room for other things that you actually really want to do.